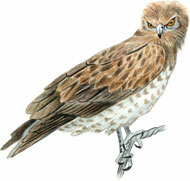 The short-toed eagle is somewhat larger than an osprey, with a wing span of 170-185 cm and a body mass of 1.8-2.3 kg. The lower half of the bird is light, usually with dark spots (the pattern can vary to a great degree), the head and chest are darker and the upper half of the body is greyish brown. The head of the rather vocal short-toed eagle is large like that of an owl and its eyes are large and yellow-orange. When flying, the eagle is easily recognized by its light underside that does not have dark contrasting patches (the osprey and the common buzzard that also have a light underside have clearly noticeable dark patches on the bends of their wings). The short-toed eagle’s rather long tail has 3-4 dark stripes and the bird’s wings are wide and flexible. The staple food of the short-toed eagle are reptiles—in Estonia usually adders and common lizards. The short-toed eagle hunts its prey over open ground—flying above treeless bogs, meadows, sands, burnt woodlands, clearings, and flood plains or stalking its prey on the top of trees that provide a good field of sight. Unlike other Estonian eagles, the short-toed eagle does not usually nest in the same place in subsequent years. A new, relatively small nest is constructed on top of a pine every year, and only one whitish egg is laid there in the middle of May. The hatching period lasts for a month and a half and the chick stays in the nest for two and a half months—therefore, an average Estonian summer is too short for the short-toed eagle to nest successfully. The last sighting of a short-toed eagle nest in Estonia was at the beginning of the 1970s. The short-toed eagle has always been very rare in Estonia, since the main natural habitat of the species lies to the south, stretching from the Mediterranean region to India. The birds encountered each year mainly in Western and Northern Estonia are mostly single, although during more favourable years, an estimated five pairs of short-toed eagles may nest here. Short-toed eagles prefer natural landscapes and they can be spotted mainly around larger bogs and widing rivers, but they also favour thinner pine forests located in bogs, heaths and moorland.